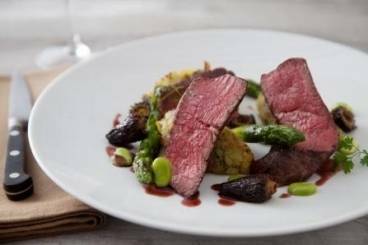 Tender fillet steak with minted and crushed potatoes, seasonal vegetables and a lighter version of a classic French butter sauce. Season the steaks with Maldon sea salt. Heat a frying pan until very hot. Seal the steak on all sides in a hot pan and then transfer to the oven to cook accordingly. Around 8 minutes for medium rare. Rest for the same amount of time as the cooking. Place the potatoes into cold, salted water. bring to the boil, reduce the heat to a simmer and cook until tender. Drain and keep warm. Prepare the asparagus by breaking off the woody base of the stalk. Peel up to the tip and then cook for 3 minutes in salted boiling water. Refresh in iced water. To serve: Gently reheat with butter. Carve the beef to show the correct cooking. Place the potatoes into a rectangular mold and lay the beef on top. Drizzle the sauce around and garnish with the asparagus.